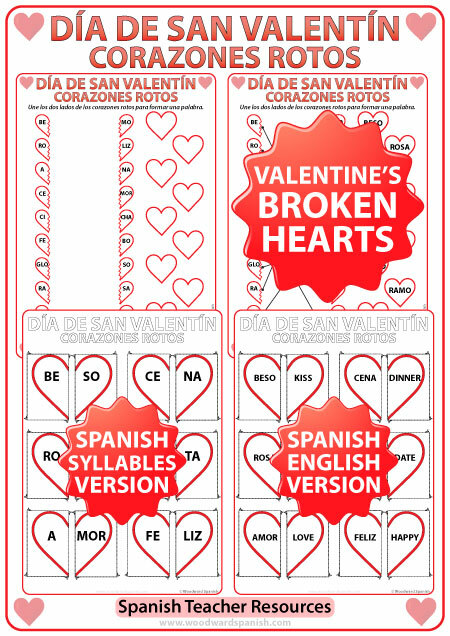 Worksheet and Flash Cards with Vocabulary associated with Valentine’s Day in Spanish. Ejercicios y Tarjetas con vocabulario acerca del Día de San Valentín. There are three activities that can be completed. One activity contains flash cards for English speakers learning Spanish. 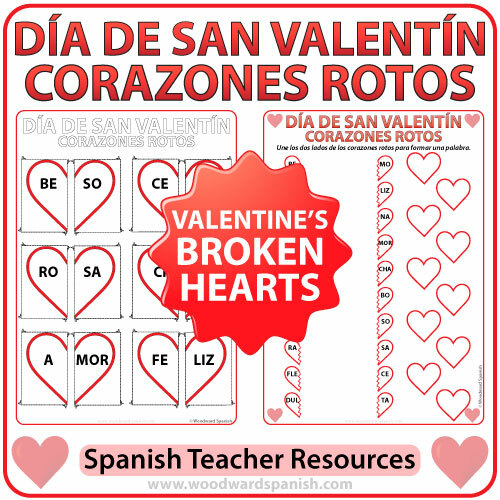 Students will need to join the left side of a heart that has a word in Spanish with the right side of the same heart with its translation in English. The second group of flash cards have the Spanish word divided into its two syllables. The first syllable is in the left heart and the second (or last) syllable is in right card. Students need to join both sides of the heart to make a word associated with Valentine’s day. The third activity is a worksheet with the same 10 words divided into their two syllables as above. Students need to draw a line between the two syllables that make a word. Then they can write the complete word in one of the blank hearts to the right. Since this is a worksheet, it can be completed as a filler during class or as homework that night. The 10 Spanish words that are being reinforced in the activities of this pack all have two syllables. These words are: amor, beso, cena, cita, dulce, feliz, flecha, globo, ramo, rosa. Todas las 10 palabras en español tienen dos sílabas. Las palabras que aparecen son: amor, beso, cena, cita, dulce, feliz, flecha, globo, ramo, rosa.